Today is the 150th Anniversary of the Battle of New Market Heights, an action in a larger series of battles that made up Ulysses S. Grant’s Fifth Offensive during the joint Siege of Petersburg and Richmond. New Market Heights is north of the James River, and thus, on the operational level, the responsibility for attacking the Confederate positions there fell to Benjamin Butler’s Army of the James. Butler in turn gave the responsibility to E.O.C. Ord’s Eighteenth Corps, which attacked up from Deep Bottom towards the direction of New Market Heights. Ord’s main thrust came from Charles Paine’s Third Division, composed entirely of United States Colored Troops (USCTs). Paine’s men attacked through the swampy bottomlands of the heights and then up into a galling fire from some of the Confederacy’s best troops, the vaunted Texas Brigade. Over the course of multiple assaults, Paine’s men went forward with brigade fronts, and suffered about 800 casualties before they were able to drive the Confederates away and capture the rebel trenches. 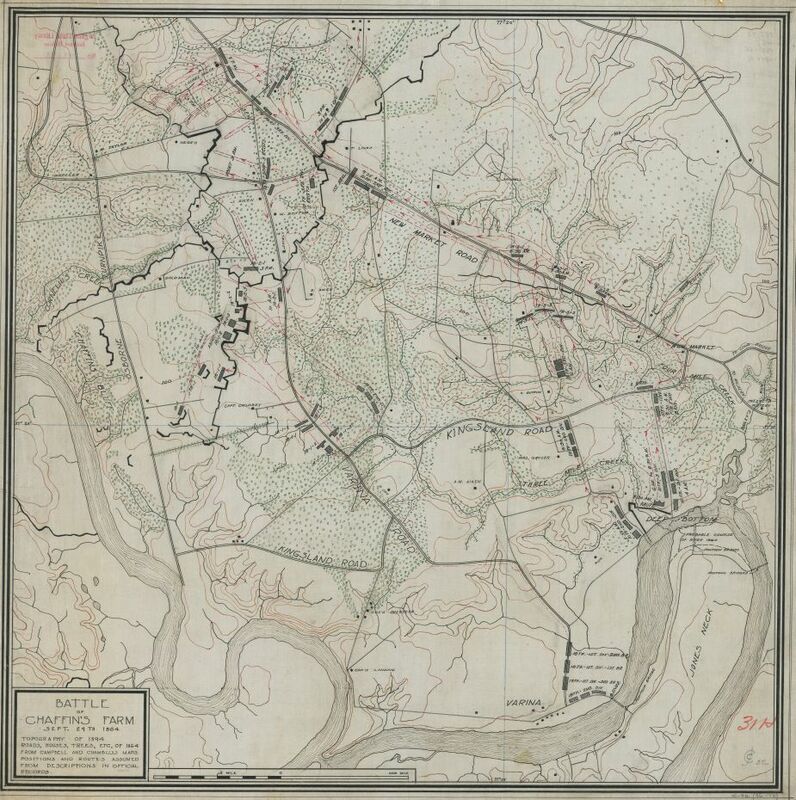 Showing the larger actions of the Battle of Chaffin’s Bluff, the Battle of New Market Heights is included on the right side, near Deep Bottom. What is most fascinating of the Battle of New Market Heights, however, is the fact that fourteen soldiers from Paine’s division were given the Medal of Honor for their actions on September 29th. Because of Butler’s political wrangling, the second interesting factor from New Market Heights is how soon after the battle many of the soldiers from Paine’s division received their commendations. When looking at Civil War records, it is not uncommon to see most of the Medals were given to their recipients in the 1890s or early 1900s, but with the USCTs from New Market Heights, the first Medals were given out on April 6, 1865. Not only was this before Lee surrendered at Appomattox Court House, it also made the recipients from New Market Heights the first black soldiers to physically be given their Medals. Chronologically, the first action that led to a black soldier being given the Medal of Honor came on July 18, 1863, with the 54th Massachusetts’ famed attack on Fort, or Battery, Wagner, in Charleston, South Carolina. 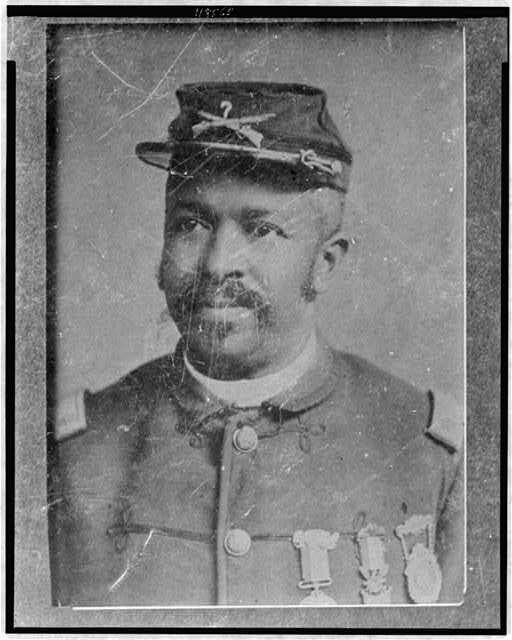 Sergeant William Carney retrieved the flag of the 54th after its failed attack on the Confederate position, and after its commanding officer, Colonel Robert G. Shaw, was killed. For carrying off the flag, Carney was given the Medal of Honor, but not until May, 1900. By that time, the first recipients from New Market Heights had had their Medals for just over 35 years. Christian Fleetwood, one of the fourteen Medal of Honor recipients from the Battle of New Market Heights, shown in a post-war portrait. Fleetwood was part of the 4th USCT Infantry at the time of the Battle. New Market Heights was another battle in a growing list of actions where black soldiers were thrown into the action alongside their white comrades and prove their fighting capabilities. Today, on its sesquicentennial, we continue to remember them. * A fifteenth Medal of Honor was given to an officer of the USCTs from New Market Heights, Captain Nathan Edgerton. First published in the 1980s and then re-republished by Savas Beatie is Richard Sommers’ Richmond Redeemed, about the whole Fifth Offensive, with a large focus also on the operations north of the James. Just published a couple of years ago by the History Press is James Price’s The Battle of New Market Heights: Freedom will be theirs by the sword, specifically about the actions of the USCTs at the Battle. This entry was posted in Emerging Civil War and tagged 54th Massachusetts, Appomattox Court House, Army of the James, Battle of the Crater, Benjamin Butler, Charles Paine, Christian Fleetwood, Fort Fisher, Fort Wagner, Honey Hill, Medal of Honor, New Market Heights, Petersburg, Richmond, Robert G. Shaw, Siege of Petersburg, Ulysses S. Grant, USCT, William Carney. Bookmark the permalink.